As someone who is absolutely terrible at saving money, it might seem like a bit of a bizarre idea for me to be writing a post it - however, having learnt a great deal from my money mistakes, I thought it made perfect sense for me to pop up a post on the things that have helped me save money - something I thought was pretty impossible up until recently. Budget - A bit of an obvious one, but it is so important if you want to save money. Sit down and write down all of your monthly outgoings and incomings, including your wage, bills, rent/mortgage, insurance, petrol, Netflix - basically everything and anything that you know goes out/comes in each month. Then, work out how much you have left over and you'll see what you've got to work with - then you'll know how much you can afford to set aside as your spending budget for the month, and how much you're able to save. Use online banking - How we managed in the days before online banking I'll never know. I am always on my online banking, either on the app on my phone or directly online, checking my balance and seeing how my savings are doing. If you're really serious about saving, I totally recommend adding separate accounts for different things - so having a bills account (which your wage goes into), a savings account, and a spending account. After you've budgeted, go into your accounts and set up standing orders so that on the day you get paid, X amount goes from your bills account into your savings, whilst X amount goes into your spending account. I do this, and I only ever use my spending account to actually buy things - so I know that each month I have a set budget that I can't go over. It makes life so much easier! 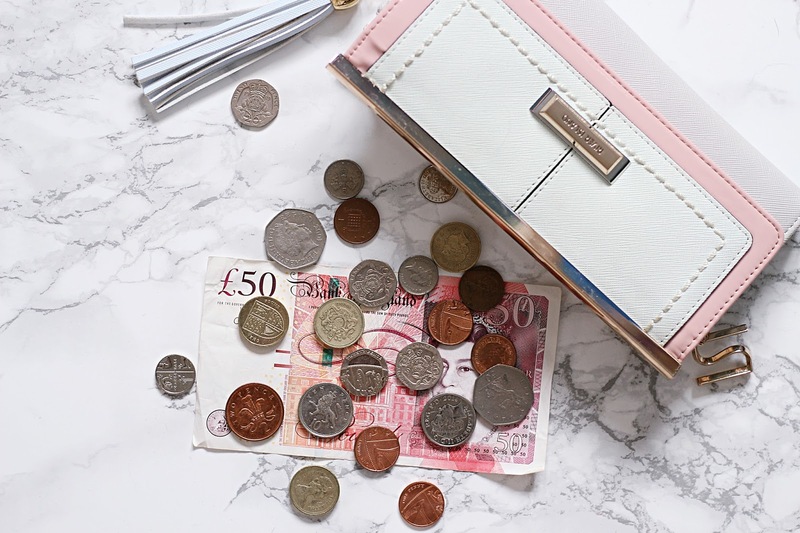 Think ahead - As I know I have a strict budget for the month, I always find it's a good idea to take a note of what I have coming up at the start of the month so I know how much I need to set aside mentally to ensure I don't overspend. So, if you have a big night out in the middle of the month and it's your mum's birthday towards the end, make sure you think 'Okay, I'll need X amount for the night out, and X amount for a birthday present and card' - then minus that from your spending budget and you'll know how much money you have to spend on yourself for the rest of the month. Write it down - A few years ago I knew my spending was getting out of hand so I decided to (ironically) buy a little book and write down everything I spent. At the end of every day I'd gather up the receipts and write it all in. It's amazing how much all those little things would add up to, and it helped doing it on a daily basis so that I could see how much I was spending week on week. Avoid impulsive purchases - Impulsive purchases are the bane of my life - I just can't resist a bargain. If something is on offer or in the sale I'm much more likely to buy it, which has never been good for my bank balance. Now that I know I need to save up if I want to be able to go on holiday, though, I always say to myself when I see something that I want to buy - 'Do I really need it?' - chances are, I'm only buying it because it's there and actually, I probably wouldn't get much use out of it. If you didn't go in the shop wanting it beforehand, unless it's AMAZING, it's probably not worth buying. And there you have it... my five top tips for saving money. Do you have any tips of your own?